Recently, The Six-Year-Old discovered the 1973 animated Star Trek series on Netflix. Her favorite episode, naturally, is More Tribbles, More Troubles. Her next favorite is any episode featuring Mr. Spock. 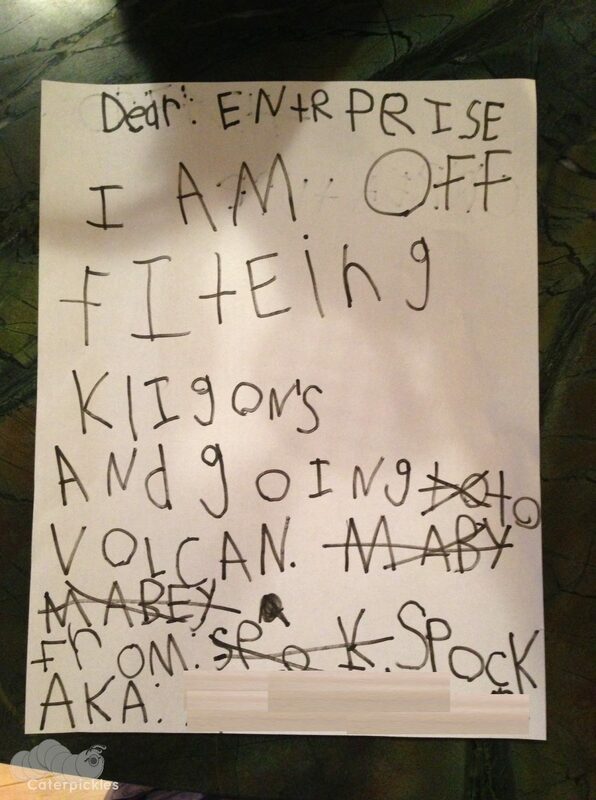 The Six-Year-Old and Mr. Spock have become especially good friends over the past few weeks. He’s taken to leaving her little notes whenever he goes on missions, like this one, which I found at The Six-Year-Old’s favorite breakfast spot this morning. (b) erased his code name to avoid compromising future missions. Almost as good as my first (and only) Star Trek story!